With an infinite amount of stars in the universe, and the billions in our own galaxy, as we search through the stars that we can see with current technology, we have come across many weird and wonderful stars. 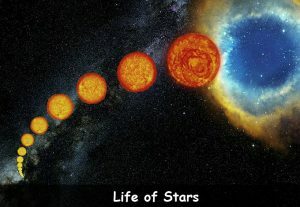 And through continuous study, we have found many different types of stars with many different star sizes. Here we will learn about the different sizes of stars that are grouped together in categories. Starting below from the smallest to the largest that we know of right now; and in the years to come, we will discover many more sizes, from very small to very large, and everything in between. White dwarfs are the smallest type stars, with a similar size to earth, and with extreme mass. The mass of these stars can be equal to that of the sun. Brown dwarfs are strange altogether. Not officially a star and not officially a planet, but somewhere in between based the sizes of the stars. Brown dwarfs are around the same size of a large planet in the solar system. Red dwarfs are one of the most common stars in the Milky Way galaxy. Larger than white and brown dwarfs but smaller than yellow dwarfs, like our sun. The closest star to earth, called Proxima Centauri is a red dwarf. Yellow dwarfs are main sequence stars which means that they are in the stable range of their life cycle. Our sun is a yellow dwarf, so yellow dwarfs are similar in size to our sun. Yellow dwarfs are a size between red dwarfs and blue giants. Blue giants are the smallest of the 7 larger type stars, and larger than yellow dwarfs. Blue giants are larger and hot. Blue giants are also very hot, and are quite rare compared to other starts. 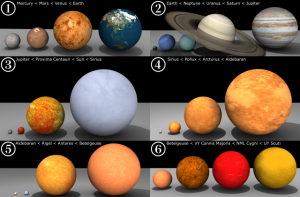 Orange giants are stars that are sized between blue and red giants. The star called Pollux is an orange giant, with the orange colour indicating that the surface temperature of the star is lower than that of a main-sequence star. Red giants are larger luminous stars that have low mass. Red giants are in a late phase of the star cycle and have burned most on the hydrogen at the core. Blue supergiant stars are in between the size of red giants and blue hypergiants. They are very luminous and very hot. They become blue supers through radiation pressure, convection and the large burning of hydrogen. These will eventually become red supergiants over time. Red supergiants are a size in between red hypergaints and blue hypergiants. These stars become red supers when high mass stars use most of the hydrogen at the core. They become supergiants through their life cycle. The well-known star ‘Betelgeuse’ is a red supergiant. Red hypergiants are the largest discovered stars in the universe so far. Red hypers generally have a shorter life span than other stars. Extremely luminous and extremely large, with the largest known hypergiant around 1600 times wider than the sun, WOW! Note that there are also stars called neutron stars, and these stars are the collapsed cores of very large stars, so they are kind of different. These stars can be the smallest stars, ranging in and around only 20 to 40 miles, however some neutron stars can also be very large, which is why they cannot be classed as the smallest, as they range differently. # 2. Brown dwarfs are failed stars. # 3. Red dwarfs are the most common stars in the Milky Way galaxy. # 4. The sun is a yellow dwarf. # 5. Blue giant stars are rare in the galaxy compared to other stars. # 6. The star Pollux is an orange giant. # 7. The sun will eventually become a red giant. # 8. Blue supergiants have short life spans and are rare compared to other stars. # 9. Blue hypergiants are extremely luminous. # 10. The largest know red supergiant is around 1800 times larger than the sun. # 11. Red hypergiants produce 66,000 times more energy than the sun. # 12. Neutron stars are so dense that a teaspoon of its matter weighs millions of tons. Q. What are the names of the 11 types of main stars? Q. What are the most common stars in the Milky Way galaxy? Q. What are the smallest known stars in the universe? Q. 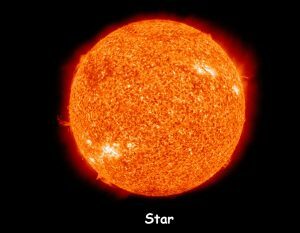 What type / size star is the sun? Q. 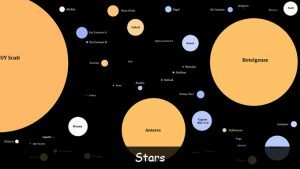 What are the largest known stars in the universe? Key Vocabulary Universe. Galaxy. Star. Giant. Dwarf.